TEHRAN -- The United States on Sunday began its military operations against Afghanistan, bombing the major Afghan cities of Kabul, Kandahar and Jalalabad. Addressing the American people after the attacks, U.S. President Geroge W. Bush said, "Today, we focus on Afghanistan, but the battle is broader. Every nation has a choice to make. In this conflict, there is no neutral ground." White House Spokesman Ari Fleischer also told the reporters that the United States, with Britain's help, had begun military strikes against Afghanistan. However, no American official has so far revealed from where the U.S. bombers had taken off. Considering that the only country that has supported the U.S. military attacks on a Muslim country is Britian, analysts question the U.S. president's self-opinionated remark that there is no neutral ground. Pentagon officials in Washington have already confirmed that the U.S. military has begun an attack on Afghanistan. "Those explosions are not thunder," said one of the U.S. officials, who were asked about explosions which eyewitnesses said were lighting up the night near the afghan capital of kabul. According to some independent reports from Afghanistan, some 25 explosions took place in Kabul in the first minutes of the U.S. attacks, which inflicted heavy casualties on Afghan civilians who were running for shelter. Meanwhile, CNN said it had heard by telephone that the airport near the city of kabul was one of the U.S. targets. However, CNN did not refer to the number of casualties. 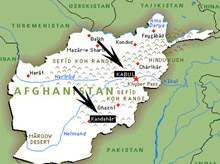 Northern alliance Foreign Minister Dr Abdullah Abdullah said at least three centers near Jalalabad may have been hit. The attack came around 15 minutes after the capital, Kabul, and the southern city of Kandahar were also hit by air raids. Meanwhile three big flashes lit up the night sky over the front line between Taleban and Afghan opposition forces some 40 km (25 miles) north of Kabul, witnesses said. Reuters cameraman Sergei Karazy, based in territory held by the opposition Northern Alliance, saw the blue colored flashes over the area of Bagram to the south. Bush's address was followed by a similar televised statement made by British Prime Minister Tony Blair. Blair confirmed that British forces are in action alongside U.S. forces against Afghanistan.